Of course, napkins are a part of every banquet table. You not only have to choose them according to the style of the table decoration, but also fold them nicely. 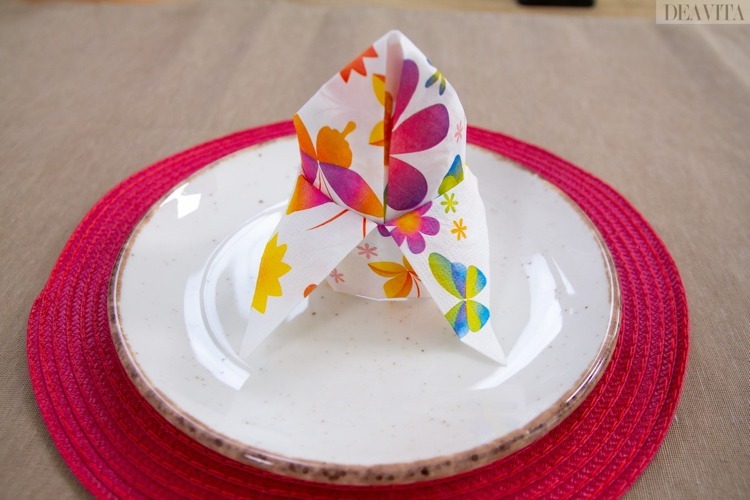 Today we’ll show you some easy napkin folding ideas. Whether fan, rose or cutlery bag – there are suitable ideas for every decoration. 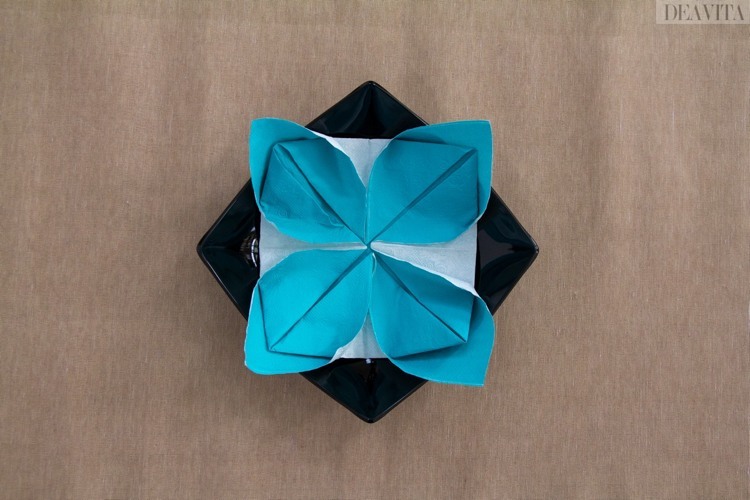 With a few simple steps you may turn paper and cloth napkins into real works of art. 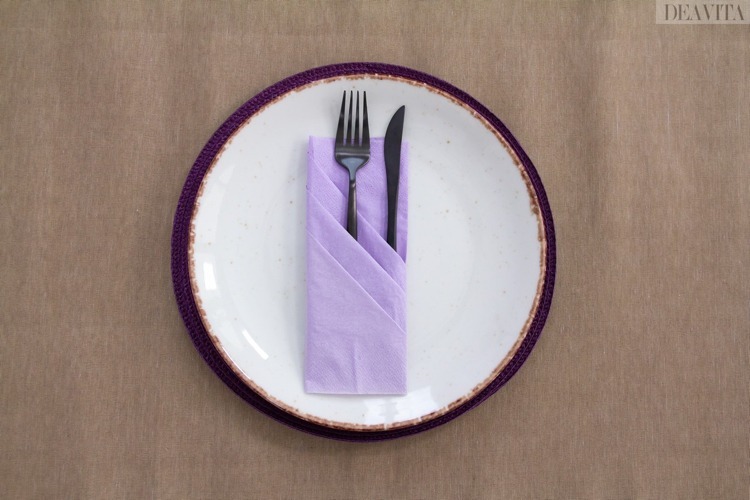 Both types of napkins have their advantages and come in beautiful designs and color variety. 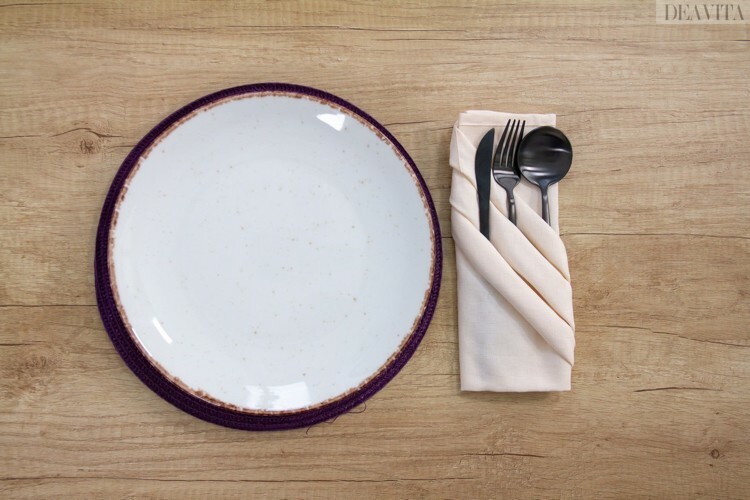 Cloth napkins look classy and are more suitable for upright folding techniques. 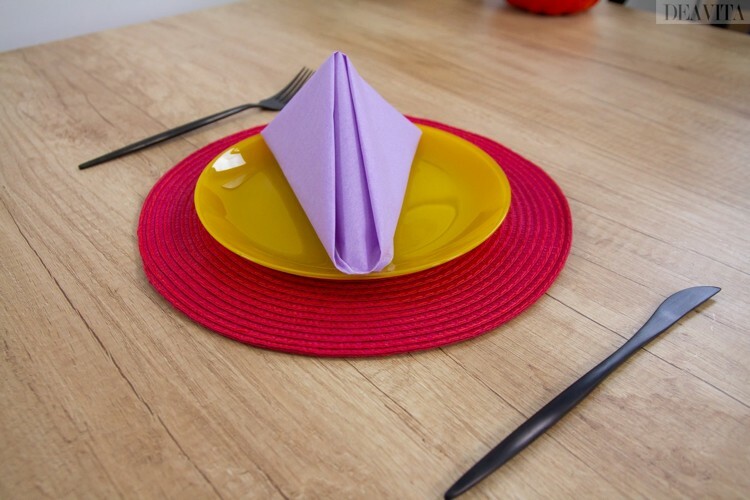 Paper napkins are usually much smaller and therefore cannot take be shaped in many forms. Take some time and just try a few options! With a bit of practice, all folding techniques are very fast. 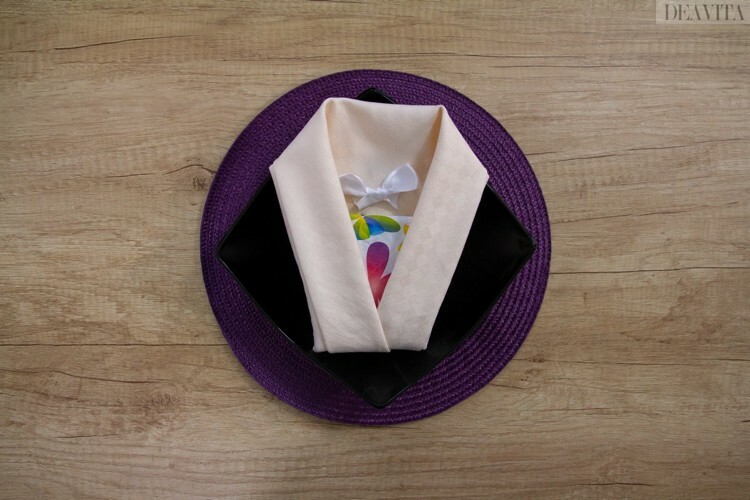 Here is the first one of the easy napkin folding ideas we prepared for you. 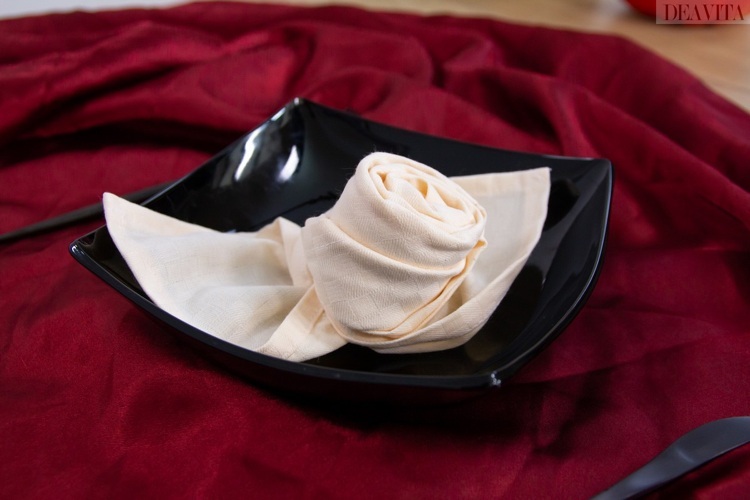 A napkin shaped as a rose looks great not only in white, but also in red! It is best to use a cloth napkin. This napkin rose would be the perfect decoration for a romantic table for Valentine’s Day. Fold the napkin into a triangle. Start rolling the long side upwards. Leave the tip and approximately ¼ of the napkin unrolled. Turn on the other side. Again start rolling up this part of the napkin that is rolled. Tuck in the end of the napkin. Separate the 2 layers by pulling them aside. Turn the napkin on the other side. Practical and beautiful, a cutlery pocket is a true classic in the world of napkin folding and fits any table decoration. 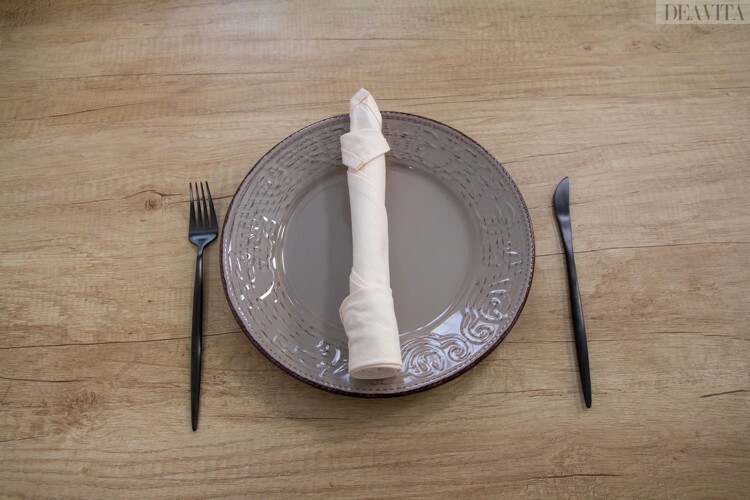 This version has three folds for placing a knife, fork and spoon. Fold the napkin in the middle, creating a rectangle. Then again fold it in the middle, creating a square. 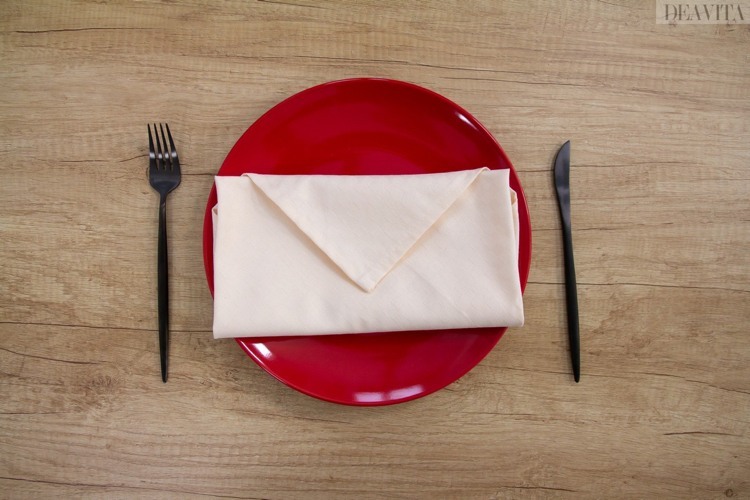 Start rolling inward diagonally until you reach the middle of the napkin. Repeat with the next 2 layers. Fold both right and left sides. Another classic of napkin folding art is the fan. It basically works with both paper and cloth napkins, but cloth napkins are more suitable for the vertical version. Fold both left and right ¼ towards the middle, creating a rectangle. 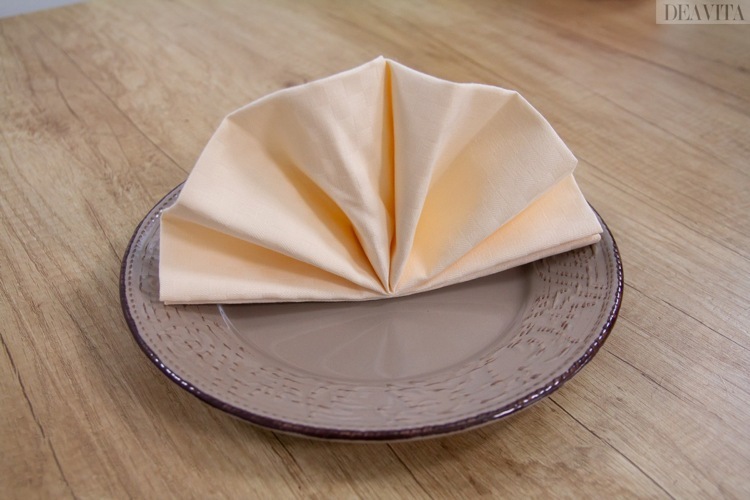 Fold the bottom 2 cm of the napkin upward. Then fold the next 2 cm of it again upward and underneath, creating a zig-zag fold. Repeat until there is 1/4 of the napkin left unfolded. Turn it on the other side. Place your finger right in the middle and bend. Tuck in the unfolded part, creating a triangle. The candle-shaped napkin is perfect for a festive table decoration for baptism, communion and confirmation. 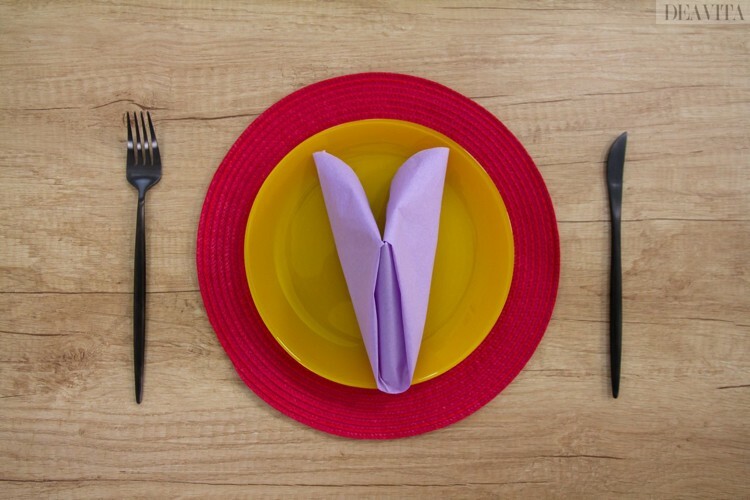 Bend the middle of the napkin, creating a triangle (with the 90-degree angle pointing upwards). Fold over 2-3 cm of the bottom. Start rolling the right bottom end towards the left one. Tuck in the left end. Unfold the upper top layer. A paper napkin can be also folded into a nice cutlery pocket. But since paper napkins are usually smaller, there is room in the pockets for a fork and a knife only. Nevertheless, the design looks very sophisticated. Take the first layer of the upper right angle and fold it diagonally. Repeat with the second layer, making a smaller triangle. Tuck the top underneath the previous triangle. Fold and tuck in the next layer. Fold approximately ¼ of it on the left side. Tuck in the bottom angle of the right folded part of the napkin in the “pocket”. This folding technique is also known as lotus flower. The motif can easily be adapted to any occasion. In pink, the flower looks particularly springlike, in blue and red, it looks good on the Christmas table. Take the upper left angle and fold it towards the center. Repeat with the other angles. Bend the left angle towards the center. .Repeat with the other angles as well. A fir tree is a must for Christmas and it can be crafted from numerous materials. 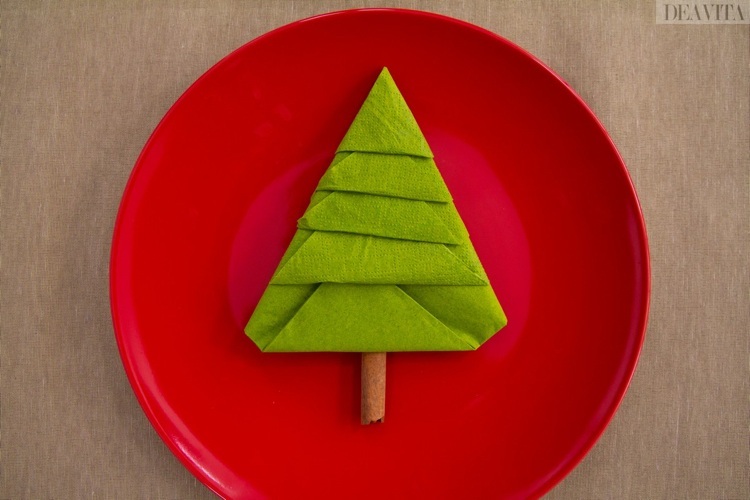 You can decorate your festive table with a beautiful napkin Christmas tree. Bend the upper layer creating a triangle. Repeat with the rest of the layers, creating smaller triangles. Fold in the shape of a Christmas tree. Fold and tuck each angle of the triangles upward. This technique requires a bit more skill. Since the French Lily is a symbol of purity and innocence, it is often used in the table decoration for baptism and communion. Fold in the middle, creating a triangle. Turn around the napkin with the 90-degree angle pointing up. Place the left angle over the half of the top. Repeat with the right one as well. Bring the top of the left triangle downwards, folding it in the middle. Do the same with the right one. Fold ¼ of the lower triangle. Then bend in the middle horizontally. Bring the lower part over the upper one. Twist the left and right angles backwards. Tuck the one end into the other. Surprise your guests with a mysterious envelope! What is in it? A card with a nice saying to think about or a small gift? 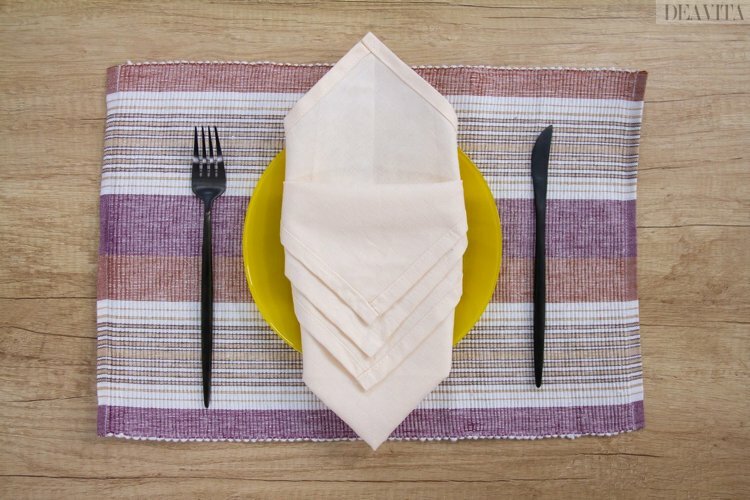 Fold the right ⅓ of the napkin, taking the right angle and placing it over the middle. Repeat with the left third. Bring up the lower angle to the center. Fold the bottom upward, creating a rectangle. Bring the top downwards like an envelope. Wind turbines fascinate young and old and are perfect as a theme for a birthday party. Folding a napkin into a windmill is quick and easy. Fold the left and the right angle towards the center. Repeat with the the upper and lower ones. Fold the left ¼ inward. Repeat with the right one. Fold the bottom ¼ upwards. Repeat with the upper one. 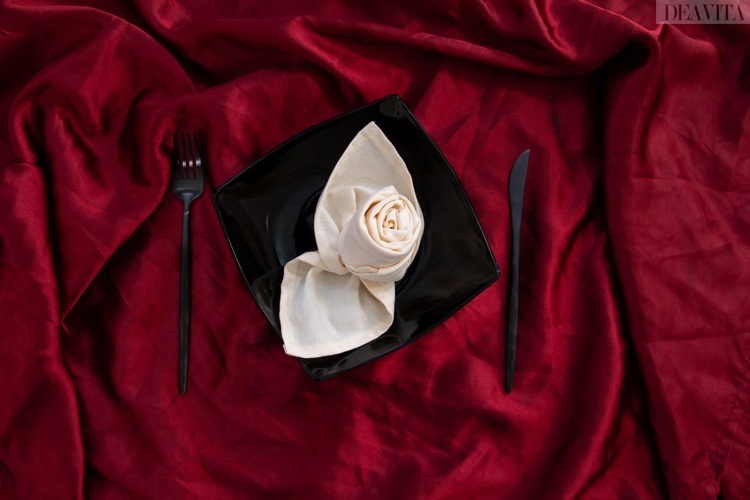 For this folding technique, it is best to choose a black napkin. Once the suit is folded, place a menu or place card in white paper. Bring the lower angle over the top one, folding the napkin right in the middle horizontally. Bend the bottom 2 cm of the napkin upwards. Turn the napkin on the other side with the 90-degree angle pointing downwards. Bring the angles on the left and on the right to the bottom angle. Make sure that there is a 3-4 cm space in the center. Again turn the napkin on the other side. Bring the right, left and bottom angles toward the center. 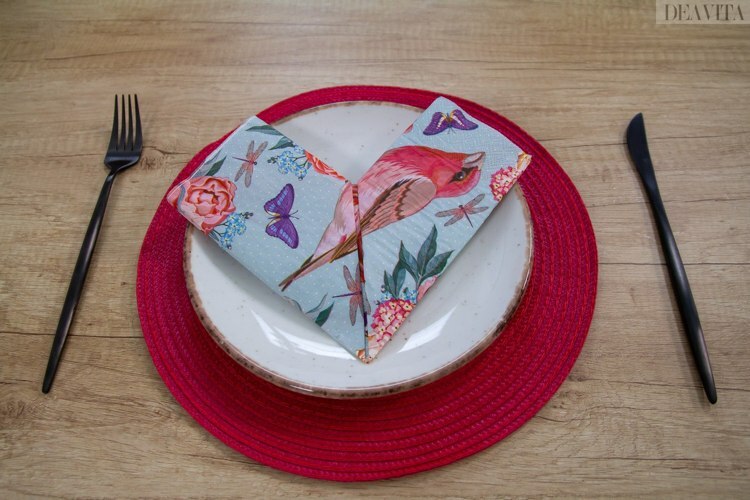 Simple and effective, this heart-shaped napkin is folded with love! Bring the 2-layered top down to the bottom. Fold the right and left angles upward. Then fold the sides upward one more time. This cutlery pocket is perfect for a wedding table decoration. In the pocket you can put a nice place card with the name of the guest. Fold a square napkin in 4, creating a square. Bring the first layer of the top angle downwards. Leave a 2 cm space between the bottom angle and the one folded. Repeat with the second and third layer. Bring the right and left end to the center. Tuck the one in the other. This folding technique is called “leaf”, “angel wings” or “rabbit ears” and looks really cute. 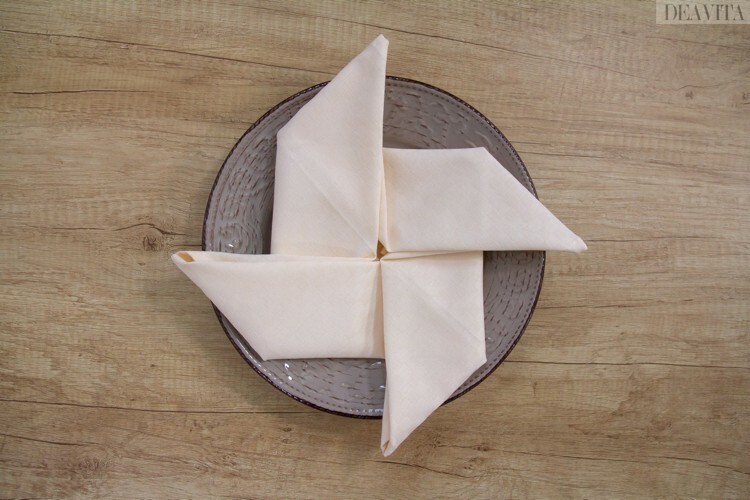 Fold a square napkin, bringing one of the angles towards an opposite one diagonally, to create a triangle. Fold the bottom 2 cm over and then under. Continue until a small part of the top is left. The pyramid creates an elegant impression when placed on a plate. The simplicity of the folding instructions makes it much easier to fold many napkins at once! Bring the right and left angles to the top, creating a square. Then bend in the middle to create a smaller triangle. 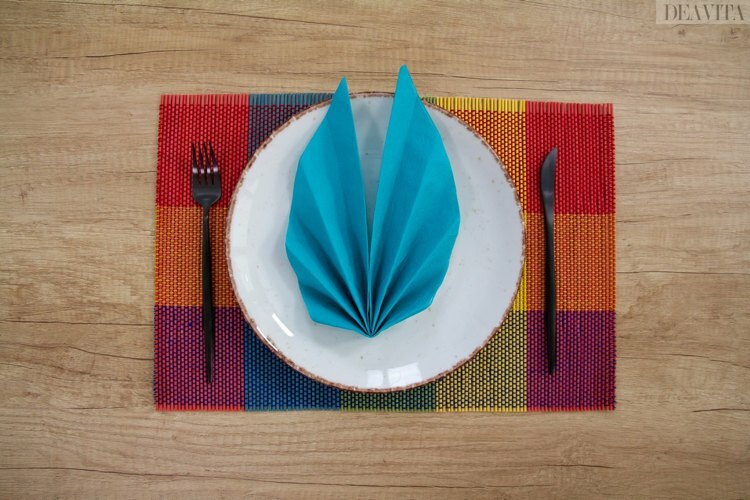 The post Easy napkin folding ideas for the festive table – 15 tutorials for beginners appeared first on Deavita Interior design and Architecture Magazine.